Tim O’Shei, LSY! founder – Live! Starring ... You! Tim O’Shei is a children’s author, journalist, teacher, and the founder of Live! Starring … You!, a media and education organization that works with schools and studios to train young “reporters,” stage high-energy and interactive author visits, and create publishing opportunities for student writers. Tim is the author of 60-plus children’s books on topics including sports, spies, princesses, survival, martial arts, creepy tales, and more. He’s also a contributing writer for Scholastic Inc.’s middle-school language arts magazine, Scope. As a sports and entertainment journalist, Tim has written for publications including The Sporting News, Dance Spirit, Runner’s World, Rinkside, Courtside, Baseball Digest, Beckett Publications, BuffaloBills.com, USAHockey.com, the Buffalo News, and many more. He spent more than a decade covering the NFL and NHL as a beat reporter, and has covered major events such as the NHL All Star Game, the Stanley Cup Finals, the NFL playoffs, NCAA bowl games and March Madness. He also covered the 2009 inauguration of President Barack Obama, and has won several state and national awards for his news, sports, feature, education and column writing. Tim has interviewed hundreds of celebrities in entertainment, sports and politics, including Christopher Reeve, Michael J. Fox, Kiefer Sutherland, Vanessa Williams, Presidents Gerald Ford and Jimmy Carter, Tim Russert, Shaquille O’Neal, Derek Jeter and LeBron James. Students involved in Tim’s Live! Starring … You! program have conducted more than 300 interviews with professional entertainers and athletes. Some of the highlights: Justin Bieber, Miranda Cosgrove (iCarly), Ross Lynch (Austin & Ally), JoJo, Cyndi Lauper, Glee stars Matthew Morrison and Heather Morris, movie star Amanda Peet, actress Debra Messing, actor Frankie Muniz, DMC from the legendary hip hop group Run-DMC, members of the Beach Boys, Goo Goo Dolls, Simple Plan, Hot Chelle Rae, Marianas Trench, Hedley, Yellowcard, We the Kings, Peter Yarrow from Peter, Paul and Mary, Weird Al Yankovic, the stars of Whose Line Is It Anyway? and Dancing with the Stars, the Imagination Movers, Fresh Beat Band, members of the New York Rangers, Washington Capitals, Buffalo Sabres and Buffalo Bills, Olympic gold medal gymnast Nastia Liukin, several internationally acclaimed figure skaters, and many more. LSY! 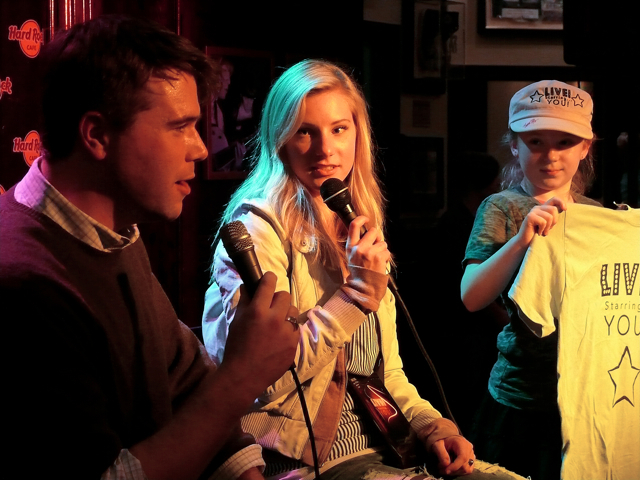 founder Tim O’Shei onstage at Hard Rock Cafe in Niagara Falls USA with Glee star Heather Morris and young actress Ina Summers. A growing educational media organization, Live! Starring … You! now has reporters in Buffalo, New York City, Cleveland, Pittsburgh, Philadelphia, Toronto and Los Angeles. Live! Starring … You! has been credentialed to cover official events by the White House; the National Baseball Hall of Fame in Cooperstown, New York; the Pro Football Hall of Fame in Canton, Ohio; the Hockey Hall of Fame in Toronto; and for multiple red-carpet events in New York and Los Angeles. For his work with Live! Starring … You!, Tim was named in 2011 to the National Honor Roll of American Entrepreneurs by the Consortium for Entrepreneurship Education. He has also been featured in both regional and national media, including a recent appearance on the Travel Channel’s Mysteries at the Museum. Tim has an undergraduate degree in elementary education from St. Bonaventure University and a master’s degree in creative studies from Buffalo State College. He is a teacher at Mount St. Mary Academy, a private high school in Buffalo, New York; and an adjunct member of the communications faculty at SUNY Buffalo State. He’s also taught undergraduate and graduate courses in the fields of education and marketing at a variety of private colleges. Tim is a New York state-licensed elementary educator and a former fifth- and sixth-grade teacher. He’s also a certified staff development trainer in the Six Traits of Writing and has developed sports-themed language arts, social studies and science curriculum programs in conjunction with the Buffalo Bills, Buffalo Sabres, and the Buffalo News’ Newspaper in Education department. Currently he develops Common Core-based teaching materials for Scholastic Inc.’s classroom magazines, including Scholastic News/Weekly Reader, Storyworks, and Scope. Tim is married with three children and lives outside Buffalo, New York. Connect with Tim via Twitter, Facebook and LinkedIn or visit his website, timoshei.com.